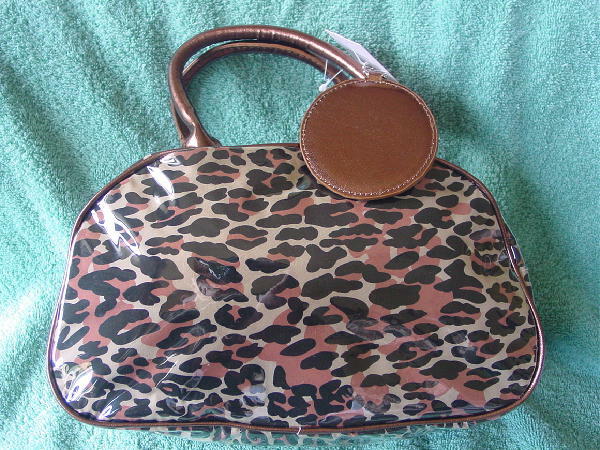 This never-used handbag has an animal print pattern in black, cocoa, and bone fabric with a clear vinyl covering. It has two 10 3/4" by 1/2" faux leather padded handles in a copper color. The edging is in the same copper color faux leather. There is a top side to side zipper (the zipper extends halfway down on each side) with a faux leather pull. 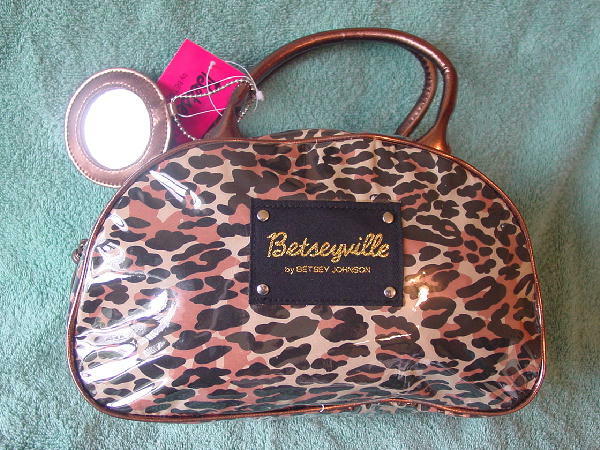 The front has a black fabric patch with silver-tone rivets in each corner and Betseyville by Betsey Johnson in gold-tone metallic thread letters. It has a silver-tone little chain with a round mirror attached (it can be removed) to one handle. The mirror is framed by the copper color faux leather. The interior has a zippered pocket and the fabric lining is in a light tan-bone color. It's compatible with another purse we have for sale.